Leigh, Stephen. 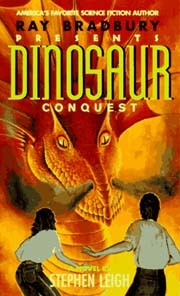 Ray Bradbury Presents Dinosaur Conquest . Avon/AvoNova 1995. Summary: Three teen-agers are enmeshed in chaotic time-storms, etc., unleashed by a time-traveling hunter and guide. Comments: A series of somewhat-more-allohistorical-than-the-original sequels to Ray Bradbury's "A Sound of Thunder", in order Ray Bradbury Presents Dinosaur World , Ray Bradbury Presents Dinosaur Planet , Ray Bradbury Presents Dinosaur Samurai , Ray Bradbury Presents Dinosaur Warriors , Ray Bradbury Presents Dinosaur Empire , and Ray Bradbury Presents Dinosaur Conquest . Samurai and Empire are co-authored with John J. Miller. Series note: First volume of Ray Bradbury's Dinosaur World. Published: Avon/AvoNova 1992 (0380762773); BP/ibooks 2004 (0743486536BUY). Series note: Second volume of Ray Bradbury's Dinosaur World. Published: Avon/AvoNova 1993 (0380762781BUY); BP/ibooks 2004 (0743486544BUY). Series note: Third volume of Leigh's Ray Bradbury's Dinosaur World. Published: Avon/AvoNova 1993 (038076279XBUY); BP/ibooks 2004 (0743493028BUY). Series note: Fourth volume of Ray Bradbury's Dinosaur World. Published: Avon/Avonova 1994 (0380762803BUY); BP/ibooks 2004 (0743493206BUY). Series note: Fifth volume of Leigh's Ray Bradbury's Dinosaur World. Published: Avon/AvoNova 1995 (038076282XBUY); BP/ibooks 2004 (0743497813BUY). Series note: Sixth volume of Ray Bradbury's Dinosaur World.